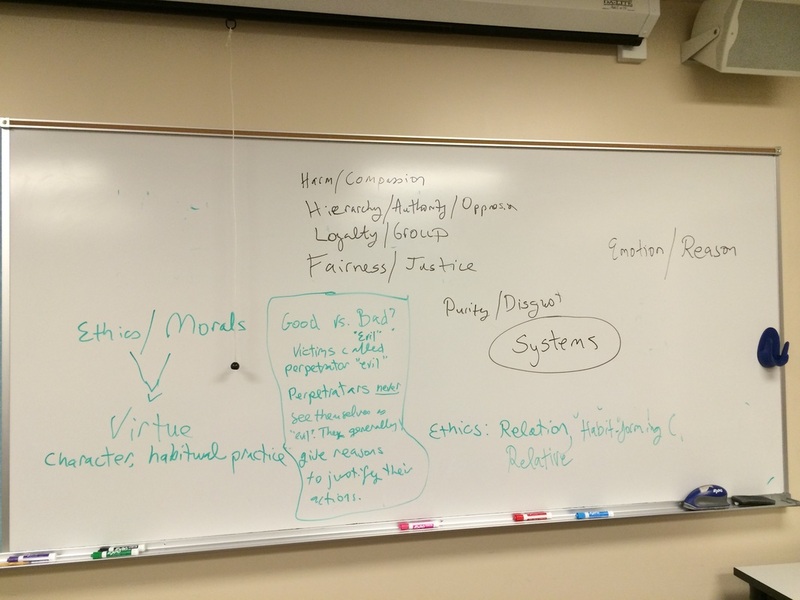 Last week we talked about ethics, morals, virtue, and "good and evil." Concerning "good and evil," I suggested that we aim towards an on-going "better" and avoid binary, final judgments. Here is a preview of the Dr. Roy Baumeister's book, Evil: Inside Human Violence and Cruelty. In this book, Baumeister summarizes the salient characteristics of the myth of pure evil. Because both "ethics" and "morals" come from root words meaning "character" and "that which we do habitually," it's helpful to consider the development of habits (through intentional practices) that promote well-being not only for ourselves, but for our world. The myth of pure evil seems to be a trap. 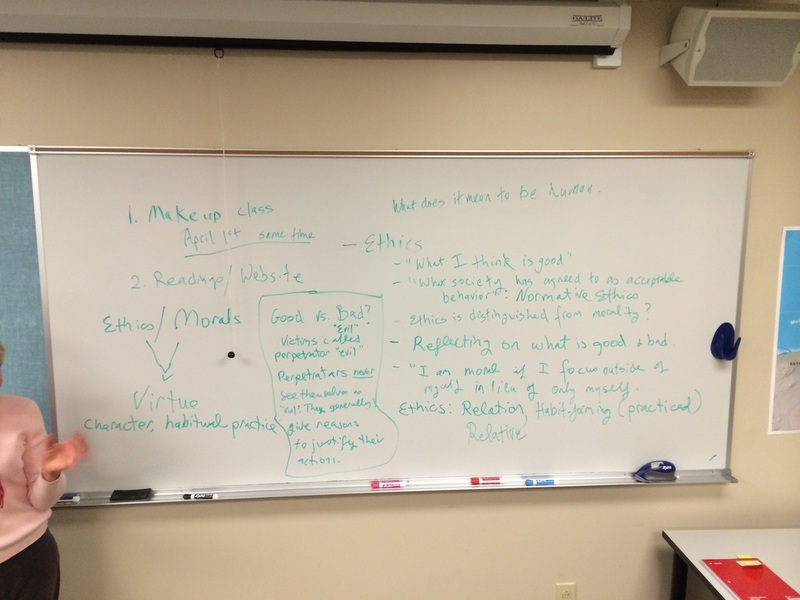 In the context of ethics, we began a discussion of the five innate modules of "moral flashes" as proposed in Jonathan Haidt and Craig Joseph's article, Intuitive Ethics (see Class 3). Photos of our blackboard notes are below. This week, we will discuss your responses and thoughts to the questions about free will. Here is a video that presents an overview of arguments against "free will" based on neuroscience. Professor Alfred Mele, author of Free: Why Science Hasn't Disproved Free Will, starts the presentation with a discussion of a range of possible definitions for "free will." In other words, depending upon how one defines "free will," it is easier or harder to demonstrate that humans possess it. He argues that the evidence is not sufficient to be conclusive. For our class, I'm proposing that our free will involves our ability to transcend ourselves. In this sense, the capacity for imagination, strategic planning and empathy are manifestations of free will. To test this sort of hypothesis will require methods very different than those used to date. I wonder if our capacity to conceive of studies to provide "proof" of free will is not itself some sort of proof. This week we will also begin to talk about evolution, natural selection and the question of whether evolution has a direction. Dr. Steven Pinker brings to bear quantitative data to support the case for human evolution in the direction of non-violence in his book The Better Angels of Our Nature. I hope we can begin to contextualize our experience with his findings through our discussions.